There’s nothing like blowing off some steam with some good train art. When you think of great works of modern art, you probably think of them as hiding away at sites such as New York Museum of Modern Art (MOMA), London’s Tate Modern and Japan’s Benesse Art Site Naoshima. You probably don’t think of Sydney’s Central Station. But for some years now, art experts, placemakers and community stakeholders all around the world have been recognizing the value of art in train and subway stations. Why? On a practical side, organisations such as VicHealth in a 2006 report, have pointed out that art in train stations can ‘reduce vandalism’, ‘increase civil pride and engagement’, ‘create community environments which are safe’ and ‘humanise unattractive or soulless station environments’. Additionally, having a station as an art landmark can encourage businesses in the immediate area through creating a safer space with more social cohesion, therefore increasing dwell time and lease prices for commercial properties (such as Retailers and Food and Beverage operators) in and around the station. But there is also the more philosophical concern that public sites offer placemakers the perfect chance to shake the public out of their dull nine to five reverie. It is in these public spaces, when the public are performing our everyday, monotonous, relentless routines that we are most perfectly positioned to excite and engage community members with the shock-beauty of the cultural. With urban capitals such as Melbourne and Sydney growing exponentially we want to make Australian cities not only more liveable, but more unexpected and fun. Let’s inject a bit of re-awakening, thought provoking situationism into our everyday lives with some awe inspiring art! By communicating to the world that train stations are not just places of transition, but can be cultural destinations too, we encourage those who oft quote “I just don’t do public transport” to change their minds. As aptly demonstrated by the skyrocketing popularity of festivals like Vivid Sydney, city-slickers are hungry for more (accessible and un-wanky) art in their everyday. Here are mine (and the Art Pharmacy Consulting team’s) favourite train art that are both beautiful, and add to a site’s sense of place. With luck, they will transport you (oops) to a reflective moment of artistic contemplation. What’s your favourite? Let me know - but choo-choose wisely. Since its implementation in 2006, the ‘Stations of Art’ project has seen 180 pieces of art installed across the southern Italian city’s metro network, with contributions by such cultural heavy hitters as Spanish architect, Oscar Tusquets Blanca. Blanca designed the striking art of Naples’ famous Toledo Station, which was in 2012 voted the most beautiful train station in Europe. 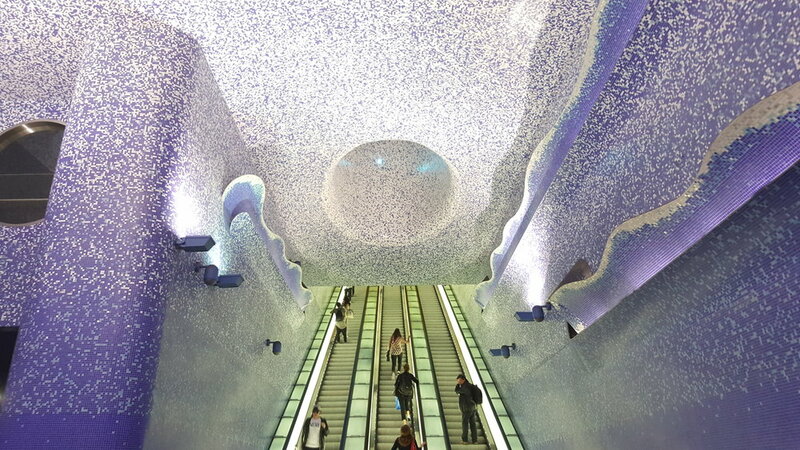 The deepening gradient of blue colour and blue LED lights as the viewer goes further into the subterranean station’s “represent(s) by the increasingly intense azure mosaics” reflects both the movement of going further underground, as well as the representation of Naples’ maritime location and history. As put by the station’s curator (and curator of the 1993 Venice Biennale) Achille Bonito Olivia, “the simple traveler becomes a recipient of an artistic message”. The station becomes “‘the obligatory museum’”. Artist Guido van Helten spray painted seven freight train carriages with local ‘characters’ who were from the town of Manildra, in regional NSW. Viewers of the work were surprised as when seeing the freight train go past, they spotted charismatic faces, instead of its regular plain sides. Van Helten is well known for his mega sized portraits, tinged with realism and faded neutral tones, in the Victorian country town of Brim, and has also completed murals across Europe, America and the United Arab Emirates. But it’s his work in Manildra that I like best - not only for its sense of surprise and spontaneity (the train goes past in a flash, leaving you wondering whether it really happened) but the way it celebrates the community, raising individuals to the status of art object. City Metric (a niche little publication that focuses on urbanism and growing cities ‘with a side order of snark’) reported that the creatives said to a local news station that they did it because they “wanted to give commuters a smile”. Just goes to show creative projects can be on the small scale as well, and still make a huge difference in the community’s day. 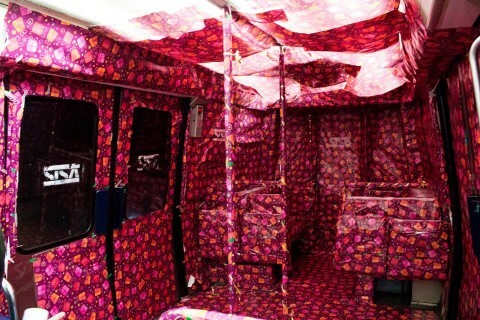 The gift-wrapped carriage, Image: Clea Polar and Gabriel Defrocourt. Created by Berlin based planners, Pfarré Lighting Design, the Hafencity Station installation sees large scale translucent boxes, filled with energy saving LED lights, suspended over the station’s platforms. The lights colour softly changes throughout the day between colour scheme that ranges from neutral golds, to deep reds, to pale lilacs. Probably the (dare I say?) coolest thing about this industrial-style installation is that the light given by the suspended boxes, which are the size of shipping containers and reflect the shape of the incoming train carriages, can be easily changed. 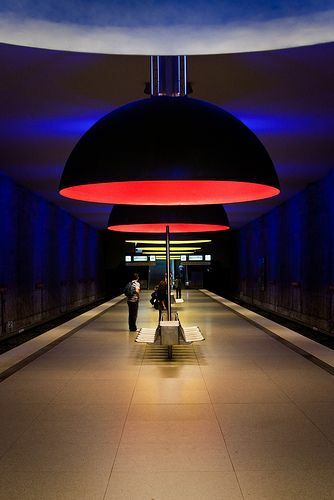 According to the green design blog, Inhabitat, the lighting colour scheme can be adjusted even ‘to reflect the station manager's mood’ that day. Pink everyday please. This incredible feat of collaboration between local artists and Storstockholms Lokaltrafik (SL - Stockholm’s public transport organisation) Arts Council saw the creation of ‘the world’s biggest art gallery’ with 110 kilometres worth of art. According to Visit Stockholm, over 90 of the 100 subway stations in Stockholm have been decorated, with 150 artists taking part so far. From the Stadion Station’s fractured rainbow celebration of the 1912 Olympic Games, to the ‘calming blue’ and ‘stylized flowers’ of Per Olof Ultvedt’s ceiling and wall mural at T-Centralen station, the works are awe-inspiring and huge on their scale and concept. There are even free guided art tours on offer for those of you lucky enough to visit the nordic capital. But if - alas - you are not free to visit, check out Expedia’s interactive map that explores all the beautiful, artsy stations in all their glory. Do you want to hear more ideas for strategy, cultural curation or implementation when it comes to metro art? Let me know at iloveart[at]artpharmacy.com.au.